A 22 year old female presented with complaints of abdominal pain, abdominal distension, nausea, vomiting and anorexia. On examination the abdomen was distended with diffuse tenderness. But there was no guarding, rigidity or rebound tenderness. Abdomino-pelvic CT scan was suggestive of Intestinal obstruction and Abdominal Tuberculosis. 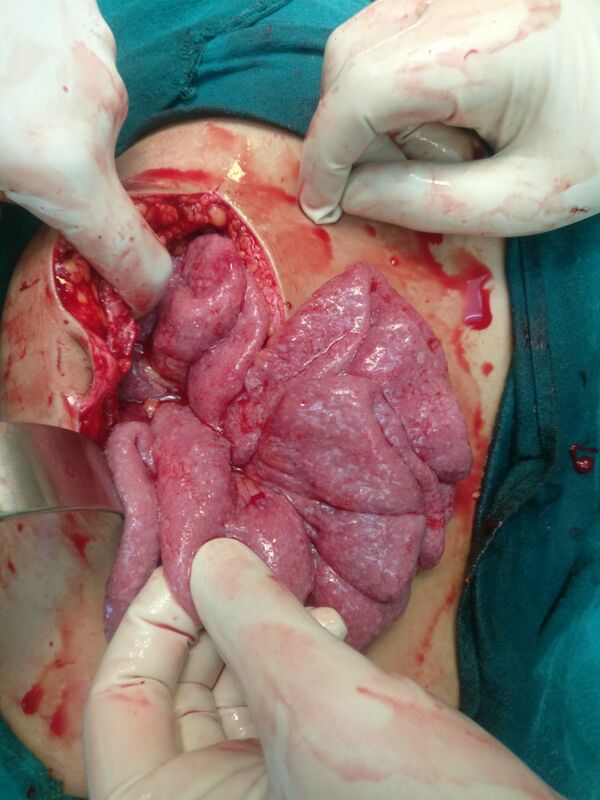 It revealed distended bowel loops, large amounts of ascites, symmetrical thickening of the peritoneum and mesentery, nodular thickening of greater omentum and mesenteric lymphadenopathy. After conservative management for first 24 hours, patient showed no signs of improvement. An exploratory laparotomy was planned. 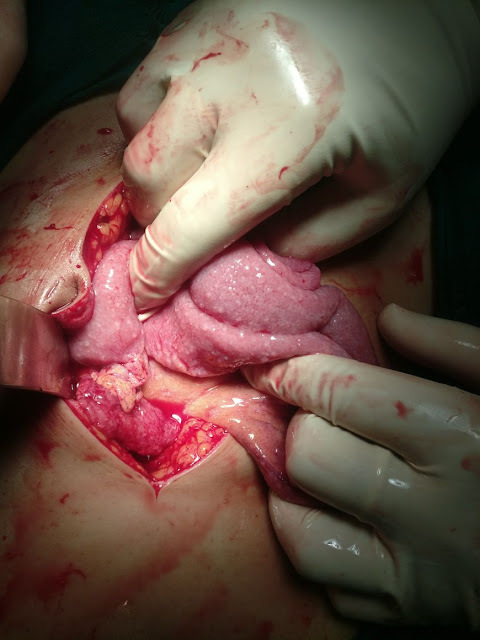 Intraoperatively it was found that Multiple Adhesions between bowel loops and an omental band were causing the obstruction. Adhesiolysis was done and thorough wash was given. Omentum, peritoneum, bowel wall, uterus and adnexa were all seen studded with tubercles. Omentum was thickened and nodular, a piece of it was taken and sent for HPE. Ascitic fluid was blood stained and a sample was taken for biochemical analysis. Postoperatively patient's condition improved and she passed flatus on 3rd POD and passed stools on 5th POD. Patient was started on antitubercular drugs and was discharged on 8th POD. Peritoneal tuberculosis is the sixth most common site of extrapulmonary tuberculosis. The top five are lymphatic, genitourinary, bone and joint, miliary, and meningeal. Only 17% of cases of peritoneal tuberculosis are associated with active pulmonary disease. Abdominal swelling caused by ascites formation is the most common symptom, occurring in more than 80% of cases. A positive tuberculin skin test response is present in most cases. But only approximately 50% of these patients will have an abnormal chest radiograph. Abdominal imaging with ultrasound or CT may suggest the diagnosis but lacks the sensitivity and specificity to be diagnostic. Ascitic ﬂuid adenosine deaminase activity, in particular, appears to be highly sensitive and specific for tuberculous peritonitis. Microscopic examination of ascitic ﬂuid for acid-fast bacilli identifies the organism in less than 3% of cases, and culture results are positive in less than 20% of cases.